#SitaraCollections The Adjustable Genuine Leather Love Bracelet is very attractive and comfortable to wear. 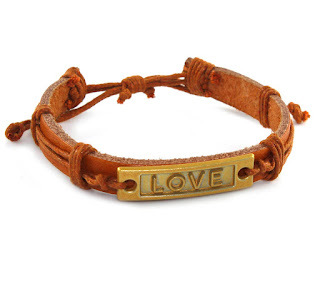 It's made of genuine russet colored leather with a metal "love" plate. Can be worn by male or female. It has an adjustable string closure and measures 7 inches long, so it will fit most all wrists. I have a very small wrist and I was able to tighten it enough to fit me comfortably. Usually I have to wear a child's size bracelet, but this one tightened just right and if you have a bigger wrist, there's plenty of room for adjustment. It's handmade so if you order 2 there may be some variance. This is a very attractive piece of jewelry, and well made. My grand daughter already has her eyes on mine. This would make a really nice gift for a loved one, Birthday, Christmas, to say "i love you", or for yourself. They are very affordably priced.